Last week, a couple of our Von Tussles got snipped, and over the past few of days, we've started saying our goodbyes. The rest of the crew goes in for surgery later this week, so if all goes as planned, they'll be leaving us shortly. I thought I would save all our departure tales until after they are all gone, and have a full week of goodbyes. Though we love these kittens dearly, and I don't regret for one second taking this big batch in, a reduction in the Von Tussle population in our home has been nice. We're currently down to four, which is much easier on Bean's nerves. I think she was starting to feel a little too out numbered by this crew as they've grown. Truth be told, I was too! As they've gotten bigger and rowdier, it feels as though their numbers have increased! But really, I'm not complaining. This has been a spectacular batch, and getting to spend time with them has been a delight. 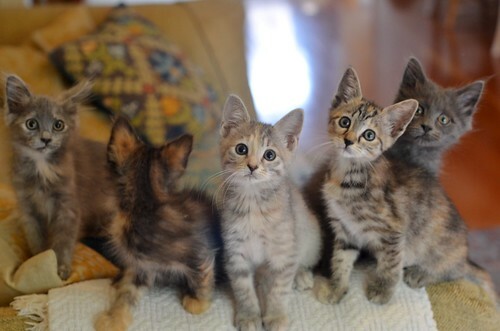 They're such a fabulous mix of colors, coat lengths, patterns and personalities. These weeks with the Von Tussles have been nothing but joy! I hope you all feel the same. It seems like yesterday this Six Pack arrived. I can only imagine how chaotic six rowdy kittens can be, it has been fun to watch the VonTussles tussle. Can't wait to find out who leaves with which sibling! I have thoroughly enjoyed this beautiful litter. I hope all their forever homes are finalized as soon as possible, but I will Mis the pics of this crew. Love that first photo, there is one in every crowd! Is my boyfriend Malcolm gone? I hope we get many pictures of his adorable smile. It seems like it was a very short time with them. They are a great litter! You'll see more images of everyone before this lot has left. They got here in early August, so they've been here for a good stretch. In the top photo, there seems to be a missing kitten. Also in the Sept 15, On the Edge post, there was a kit missing. A little camera shy? Not shy, just not in the frame in that moment. Malcolm, who is missing in the top shot is in the second shot. 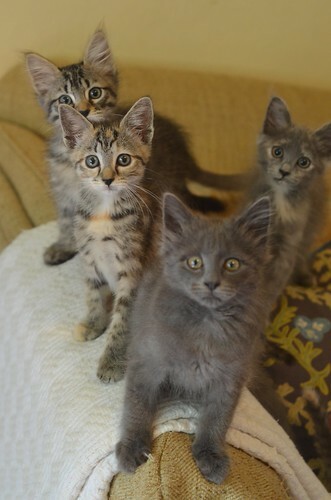 All kittens are in the photos in the On the Edge post, just not all six at once. They all look a bit worried about something (except Claudette, who's more interested in whatever is behind her). I hope some lucky person/family has snapped up Claudette and Cosette by now... I'll look forward to reading the happy tales of the Von Tussles' new homes. We sure will miss them!!! Thanks for sharing with us such precious little babies!